Journal : The Journal of the Royal institution of Great Britain. Notices of the ; vol ix. London : William Clowes & Sons, 1882. Description : 161�0 p., [1 l] pl. ; ill.: 24 phot. figs. ; 22 cm. Photographs : 1 folding leaf with 4 panels of Galton composites and photographs, reproduced by autotype. Photographer : Sir Francis Galton. Subject : Physiognomy — Photoanthropometry ; Criminals, &c.
Author caption: Francis Galton, Esq. F.R.S. M.R.I. Read before the Royal Institution of Great Britain, weekly evening meeting. Friday, April 25, 1879. Photo caption (panel 1): 6 Likenesses of Alexander the Great, and the composite of them in the centre. Photo caption (panel 2): Likenesses of six different Roman ladies, and the composite of them in the centre. Photo caption (panel 3): 5 likeness of Napoleon I. taken at different periods, and the composite of them in the centre. 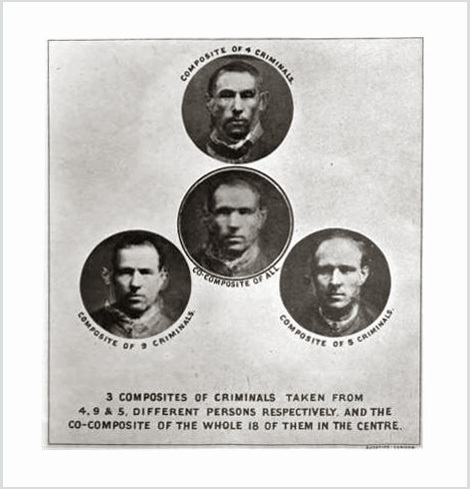 Photo caption (panel 4): 3 composites of criminals taken from 4, 9 & 5, different persons respectively, and the co-composite of the whole 18 of them in the centre. Photo caption (panel 4): Autotype, London. * The accompanying illustrations have been photographically transferred (on a reduced scale) to stone, and lithographed by the Autotype Company, 36, Rathbone Street. They are very successfully done, and are nearly equal in clearness to the originals. The composite of the Roman ladies comes out unfortunately a little too dark, and some of the beauty of the original is thereby lost. —Page 165. It might be expected that when many different portraits arc fused into a single one, the result would be a mere smudge. Such, however, is by no means the case, under the conditions just laid down, of a great prevalence of the mediocre characteristics over the extreme ones. There are then so many traits in common, to combine and to reinforce one another, that they prevail to the exclusion of the rest. All that is common remains, all that is individual tends to disappear. —Page 163. Reworked copy of a paper first published in 1879 without the photographs. With a passing reference to the work of the Begium astronomer and statistician, Adolphe Quetelet (1796�74), Galton lifts the hem of his robe to reveal the plinth on which he stands.